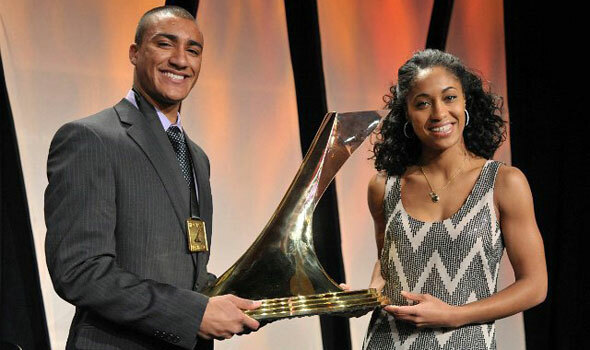 SAN ANTONIO, Texas – In a night full of pomp and circumstance, elegance and entertainment, Virginia Tech’s Queen Harrison and Oregon’s Ashton Eaton were crowned as the 2010 recipients of The Bowerman. Awarded by the U.S. Track & Field and Cross Country Coaches Association (USTFCCCA), The Bowerman is awarded to the year’s best collegiate track & field athletes. In 2010, Eaton, a native of Bend, Ore., netted a second-straight NCAA heptathlon title during the indoor season and a third-consecutive NCAA decathlon crown outdoors. Scoring 6,499 points at the NCAA Indoor Championships, Eaton topped the 17-year-old world record held by Dan O’Brien. Twice during the indoor season, Eaton bettered the heptathlon collegiate record. Outdoors, Eaton scored over 8150 points in each of his three decathlons, and beat the NCAA Championships meet record in the event. Eaton was the USTFCCCA National Field Athlete of the Year during the indoor season and shared the award with Ryan Whiting outdoors.